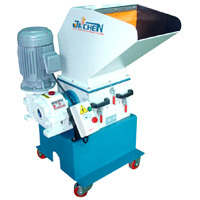 Recycling Machine - Low speed Granulator(JH Series) - Sinchung(Jachen) Technology Co., Ltd. This series is to grind items into scraps or flakes, especially for eletronic product waste. Low noise and low speed for an low decibels environment. Special tools are made of steel and vacuum heat treated to increase operation life. Design of a separate breaking room facilitates cleaning. Primary crushing and fine breaking are conducted at the same time to increase work efficiency. It` s suitable for electronic products, nylon fibers, ABS, acrylic, AS and PS, and etc. Built-in emergency safety switch, allows automatic stopping, when screening base and hopper are being opened. Special designs made to order for meeting clients need. Easy maintenance, and less fee. We can afford many models for granulated scrap and capacity volume concern and satisfied client` s requirement.